The average garage door gets used quite a lot on a regular basis, so it only stands to reason that it will experience a lot of wear and tear as time goes by. While these systems are definitely designed to withstand several years of daily "abuse", there will come a time when it will become necessary to start thinking of replacing your old overhead door. Some of these reasons may be aesthetic, while others may be a structural or safety necessity. If you've had your garage door for a while, it is only a matter of time before some of its different moving parts will start to malfunction. In the beginning it’s worth simply getting things repaired. However, the older your door gets, the more frequently it will need to have something repaired or adjusted, and it will eventually hit a point of diminishing returns, when simply getting the entire system replaced will be the better, more affordable choice. An old garage door will inevitably develop signs of wear and tear. The panels may have a few dents and scratches, or their paintwork may be starting to flake off. Even after repeated repainting, some evidence of their age will be undeniable. 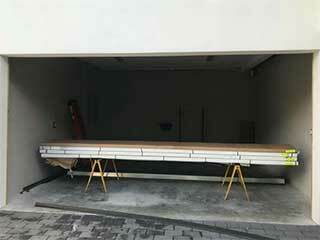 No matter how beautiful your home and front yard may be, an "aging" garage door will take away from that beauty. Getting a new one installed can improve the curb appeal of your home, which can be especially beneficial if you're considering putting your house on the market. Like every other access point to your home, your garage door can become an exploitable security breach. The older it gets, the easier it will be for burglars to break in through them. Furthermore, most people don't just park their cars in their garage, they also use them to store things like tools and other miscellaneous equipment. If your door isn't properly insulated, it'll be harder to protect your stored belongings. The older your garage door gets, the more likely there are to be gaps in the framework and even tiny holes in the door itself. This could result in hot air escaping during the winter or getting in during the summer. If this is the case, it is likely that your HVAC unit will need to work harder to maintain your desired indoor temperature. A new insulated door will save you money on your energy bill, and will be better able to protect your stored belongings. Contact our team at Garage Door Repair Lake Elsinore to have our experts help you find the perfect new model for your home.